Herein, we report our experience with a 3-month-old boy who presented with lipofibromatosis of his left foot accompanied with multiple other congenital anomalies, i.e., syndactyly, bilateral complete cleft lip and palate, trigonocephaly, as well as atrial septal defect (ASD). A 3-month-old boy presented with a mass in his left forefoot [Figure 1]a. He has had this mass since birth with about 10% enlargement during 3 months. The mass was nonmobile and firm. The overlying skin was unremarkable. Aside from the mass the patient had other congenital anomalies composed of bilateral complete cleft lip and palate [Figure 1]b, right-hand syndactyly, trigonocephaly [Figure 1]c, as well as ASD. There is history of full-term vaginal delivery. There is no history of any consanguinity. His mother did not have any history of valporic acid therapy. The Karyotype of the patient and his parents were normal. Imaging studies showed a mass with poorly defined margins measuring 5 × 4 × 2 cm with no connection to bone. At surgery, the mass was found to be attached to forefoot soft tissues. The excised mass was gray and soft, measuring 5 × 4 × 2 cm. 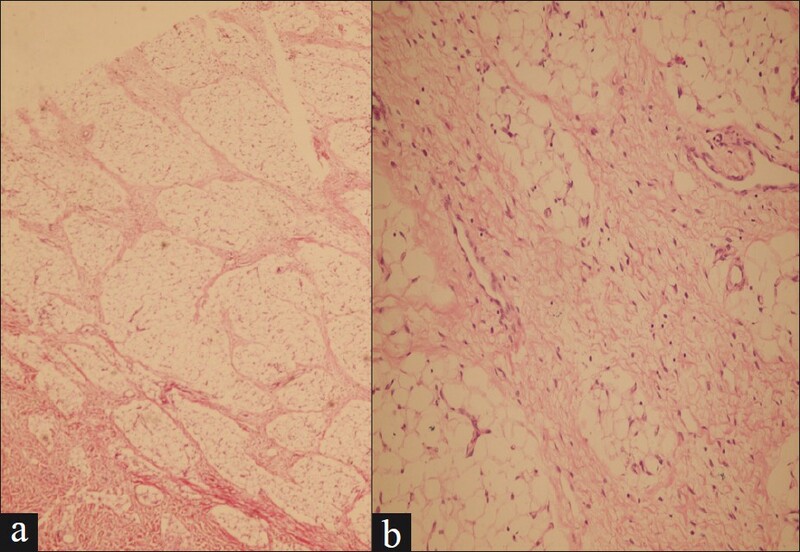 Microscopic examination showed mixed population composed of lobules of mature adipocytes (70%) traversed by bundles of fibroblasts (30%) [Figure 2]a and b. The diagnosis of lipofibromatosis was made with involved margins. Immunohistochemistry was negative for cytokeratin, desmin, SMA, and HMB45, but positive for S100 (adipocytes), CD34 (fibroblasts), CD99, and vimentin. MIB-1 index was less than 1%. Repair of the cleft lip were performed. The patient did well after surgery. His craniosynostosis was also repaired successfully. Now he is well and completely free of tumor after 6 months of follow-up. He will be operated for cleft palate and syndactyly in the near future. There are many syndromes associated with trigonocephaly such as atelencephaly, chromosomal anomalies like 7p deletion, 9p monosomy, 11q monosomy, C syndrome, BOPS or C-like syndrome, Fronto-ocular syndrome, Frydman trigonocephaly, Goldblatt syndrome, Holoprosencephaly, Lin-Gettig syndrome, Say-Meyer syndrome More Details, and Valproic acid embryopathy. C syndrome, BOPS, atelencephaly, and valproic acid embryopathy have both cardiac abnormalities and cleft/lip palate. There has been no history of valporic acid ingestion by the patient's mother, so valporic acid embropathy is excluded. This case might be a new syndrome or a variant of Opitz syndrome with facial abnormalities, cleft lip/palate, cardiac deformities, and lower limb lipofibromatosis. 1. Fetsch JF, Miettinen M, Laskin WB, Michal M, Enzinger FM. A cilinicopathologic study of 45 pediatric soft tissue tumors with an admixture of adipose tissue ad fibroblastic elements, and a proposal for classification as lipofibromatosis. Am J Surg Pathol 2000;24:1491-500. 2. Walton JR, Green BA, Donaldson MM, Mazuru DG. Imaging characteristics of lipofibromatosis presenting as a shoulder mass in a 16-month-old girl. Pediatr Radiol 2010;40(Suppl:1):S43-6. 3. Grogan DP, Bernstein RM, Habal MB, Ogden JA. Congenital lipofibromatosis associated with macrodactyly of the foot. Foot Ankle 1991;12:40-6. 4. Teo HE, Peh WC, Chan MY, Walford N. Infantle lipofibromatosis of upper limb. Skeletal Radiol 2005;34:799-802. 5. Deepti AN, Madhuri V, Walter NM, Cherian RA. Lipofibromatosis: Report of rare paediatric soft tissue tumor. Skeletal Radiol 2008;37:555-8. 6. Kabasawa Y, Katsube K, Harada H, Naguma K, Terasaki H, Perbal B, et al. A male infant case of lipofibromatosis in the submental region exhibited the expression of connective tissue growth factor. Surg Oral Med Oral Pathol Radiol Endod 2007;103:677-82. 7. Kenney B, Richkind K, Friedlaender G, Zambrano E. Chromosomal rearrangement in lipofibromatosis. Cancer Genet Cytogenet 2007;179:136-9. 8. Nagarajan G, Deshpande A, Supe A. Progressive macrosyndactyly due to nerve territory-oriented lipofibromatosis: A case report. Surgery 2002;131:468-9. 9. Azimi C, Kennedy SJ, Chitayat D, Chakraborty P, Clarke JT, Forrest C, et al. Clinical and genetic aspects of trigonocephaly, a study of 25 cases. Am J Med Gen 2003;117A:127-35. 10. Kaname T, Yanagi K, Chinen Y, Makita Y, Okamoto N, Maehara H, et al. Mutations in CD96, a member of immunoglobin superfamily, causes a form of the C (Opitz trigonocephaly) syndrome. Am J Hum Genet 2007;81:835-41. 11. Bohring A, Silengo M, Lerone M, Superneau DW, Spaich C, Braddock SR, et al. Severe end of Opitz trigonocephaly (C) syndrome or a new syndrome? Am J Med Genet 1999;85:438-46. 12. Opitz JM, Johnson RC, McCreadie SR, Smith DW. The C syndrome of multiple congenital anomalies. Birth Defects Orig 1969;2:161-6. 13. Bohring A, Gretel G, Oudesluijs GG, Grange DK, Zapino G, Thierry P. New cases of Bohring -Opitz syndrome, update, and critical review of the literature. Am J Med Genet 2006;140A:1257-63. Kuśnierz, P., Zapała-Pośpiech, A., Wyszyńska-Pawelec, G., Kosowski, B.